This page is a translated version of the page Mallat and the translation is 100% complete. 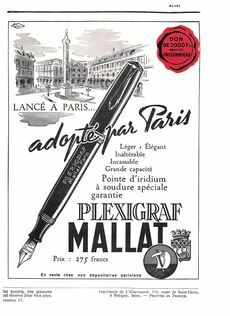 Mallat is one of the historical French fountain pen producer, and since it was founded in 1842 is also one of the oldest manufacturers of writing instruments in the world, and perhaps it can also be considered, for the invention of Siphoïde, the first producer having launched on the market a real fountain pen precursor. 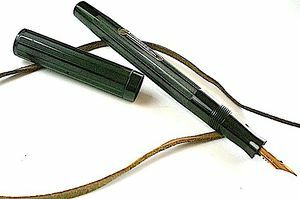 Despite its beginnings the actual production of fountain pens started at the end of World War I, with a peak of production in the postwar period, when the company was noted for being among the first to use plastic. Fountain pen production stopped around the 60's, when they were removed from the market the success of the disposable ballpoint pens. Mallat fountain pens are of good quality and the older ones are still experiencing a quite good collector's interest. Mallat is probably one of the oldest manufacturers of writing instruments from around the world, its founding by Jean Benoit Mallat, traces to 1842. In 1852 Jean Benoit Mallat first patented a pen with metal nib and in 1864 patented the Siphoïde, a real ancestor of a fountain pen, and probably the first writing instrument equipped with a reservoir that has been produced and marketed. From its beginnings, the company always operates in the field of writing materials with nibs and straws and other stationery items, while the actual production of fountain pens only began after World War I (although there are some who reports the date of 1916) with the introduction of various models: the Regulier an eyedropper filler model, the Sureté, a safety filler, and the Automatic, a lever filler. They were identified respectively by the letters "R", "S" and "A" before the number of model. In the early '30s Mallat introduced the celluloid producing models with both lever and button loading system, using streamlined shapes and conical-shaped ends. In the 1930 they introduced the 120 a lever filler ladies model, produced in iridescent colors, and the 130, also a lever filler. The 150 and the Integral models, introduced in 1936, where instead button filler, produced with the goal of a better ink capacity, as dictated from the French market trend of that period. Having overcome the unlucky period of Second War II, Mallat was one of the first european companies to realize the potential of injection plastics and began to shift production from celluloid to it. In 1943 the plastic made Plexigraf series was introduced, again a button filler. It was followed the next year by the Junior Plexigraf for the women and student market. The Plexigraf model will be produced for all the '40s in different versions, from the first one of 1943, named Plexigraf 14, to new models like the Plexigraf 225 and the Plexigraf 315, always made of black plastic to the coloured Plexicolor series introduced in 1946. In the late '40s, when the the ink visibility trend reached the french market, Mallat produced a piston filler model, the 310. In the '50s the company focused its advertising on the characters of Malatin and his dog Whisky (trying to mimic the success of Tintin) and introduced new models named Leda, Ambassador and Commodore. They were equipped with chromed or gold plated metal caps, initially made using a button filler system, they were later converted to the accordion filler. The fountain pens production was permanently closed in the '60s, shortly after the acquisition of the Edacoto brand. The company nevertheless remained present in the writing instrument market, having a significant production of economic ballpoint pens, for the same low end market were also produced some insignificant cartridge filler fountain pens. In the mid 90's Mallat was acquired by a multinational operating in the field of stationery and the brand is now disappeared. Brand page on a decommissioned website on French fountain pens.